The College of Pharmacy and Nutrition Medication Assessment Centre (MAC) and the non-profit charity Student Wellness Initiative Toward Community Health (SWITCH) are teaming up to improve health care in Saskatoon’s core neighbourhoods. MAC pharmacists will collaborate with other SWITCH team members such as the family physician or nurse practitioner review to patients' medications, provide recommendations for changes and help patients better understand their treatment. "Medications play such an important role in patients' treatment and quality of life, and pharmacists continue to play a larger role in health care" said MAC co-ordinator Eric Landry. "Pharmacists need to be connected with patients' health to ensure they are on the most appropriate medications, the medication combinations are safe and side effects are minimized." MAC pharmacists will now provide medication assessments at SWITCH during Wednesday evening clinics at no cost to the patient. Patients can be referred to the service by their health care providers or they can self-refer by calling 306-966-6392. Launched in February 2014, MAC provides medication assessments for patients on multiple medications, or those who have questions or concerns about the medications they are taking. A pharmacist will sort through complex drug regimens and drug histories, natural products and over-the-counter medications to get a clear picture of a patient's full medication intake. The pharmacist can then provide the patient with information on how their medications affect their daily lives and send recommendations to the patient's primary care provider. People are encouraged to consider booking MAC services for themselves, family, or friends who are taking five or more medications, are experiencing drug related side effects, who are having trouble remembering to take their medication or are taking them incorrectly, have chronic conditions (diabetes, high blood pressure, chronic pain) or who have multiple drug related questions. SWITCH is a student-managed interdisciplinary wellness project based out of the Westside Community Clinic. The aim of the project is to provide after-hour health services to the residents of Saskatoon's core neighbourhoods. 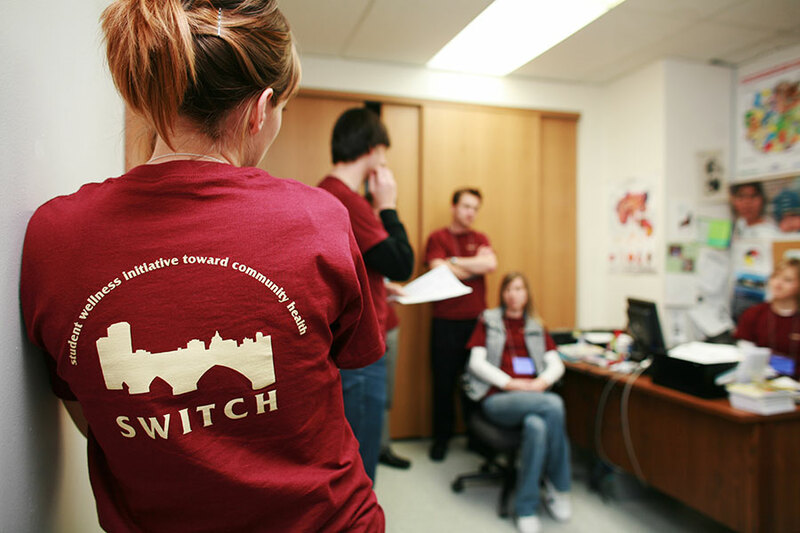 Students from the University of Saskatchewan, University of Regina, SaskPolytechnic, First Nations University of Canada, and Saskatchewan Indian Institute of Technologies volunteer their time to SWITCH.